Important Life Lessons Are Not Always Announced In Advance, Often They Will “Sneak” Up On You! It is not possible to know when you are about to be taught an important lesson. You seldom see those types of lessons in advance, but you are usually able to look back on them for the rest of your life and never forget them. Somewhere around the age of twelve or thirteen, thoughts of one day becoming an engineer or even an entrepreneur never entered my head. This particular summer, my thoughts and my focus were centered on a much more important goal. It was a goal that I had set for myself without any encouragement or consultation from anyone. That goal was to become the fastest runner in not just my neighborhood, but all the surrounding ones as well. With absolutely no bragging involved, I was naturally quick compared to most anybody I ran against. So, with very little effort I had won nearly every race that I could remember at the time. In some ways, nothing. But if you think about the lessons I learned, it has everything to do with business. While preparing for the big race which was just a few days away, I saw a commercial on TV. It advertised the “fastest sneakers in the world!” I had never ever seen that commercial, but I just knew that I had seen that ad on that day because of “divine intervention”. I was meant to have those sneakers and to win that race. I had no doubt about it. So, I approached Mom to plead my case and to ask her to buy those sneakers for me. My plea did not go well. In fact, it fell flat. So, I went to Dad and he countered quickly by asking, “What did your mom say?” Dang Gum It! Now, this was getting very serious, but nobody seemed to understand just how serious, so I went into high gear with my pleads to Mom. Finally, she made me a counter offer and I knew that was the best that I could get. She knew that I had some personal money that I had been saving from odd jobs and that I always hated to spend MY money. So she did something that caught me completely off guard. She reached out and kissed me several times and when I relaxed, she “sucker punched me” with an offer I wasn’t expecting. Her offer was that she would match whatever money I chose to use from my personal savings, but she warned me that she and Dad would not replace my money if I use it for these sneakers because I had perfectly good sneakers already. Well, I took her up on that offer and I drained my piggy bank! Mom kept her word and matched my savings. And my lessons began. The amount of money I had when I reached the department store was all that I could gather. Being young and not very smart, I was on my own to make the purchase completely on my own – Mom’s idea. I stopped breathing. And after what seemed like forever, I think the salesman noticed that I was about to faint and he grabbed me and said, “I can tell that you want these shoes – so here is what I am going to do for you. I can’t sell you the sneakers you wanted, BUT I can give you my word that I have a pair of sneakers that are just as good and YOU DO have enough money for them. These other sneakers have not been advertised to the public yet. They are still very much a BIG SECRET! Son, You can trust me on this as I am a sneaker salesman and I don’t make promises that I can’t keep“. Well, believe it or not, the price of these other sneakers turned out to be EXACTLY the same amount of money that I had that day. I was amazed by that and considered that I was being given another sign that these “secret sneakers” were meant for me and this big race. I kept my “secrets sneakers” hidden until just before the big race. I slipped them on, laced them up and proudly approached the rest of the guys. Somebody spotted my shoes and made an announcement – “Look at those shoes! Man, he must really be ready!” I certainly felt that I was ready. And, so the race began and as quickly as I had paid for those “secret sneakers”, I realized that I was no longer the fastest runner in the neighborhood. I had actually just lost the race and I had no idea why because I had always been faster than even the guy who won the race. He disagreed with me. He told me that in the big race that I wobbled funny and that it definitely was different from how I used to run. So we set up another race, but I used my old sneakers that time. I won the race against the same guy who had just beat me. And, I was told that I ran my old way, not the wobbly way. That news really made me curious, so I pulled out the “secret sneakers” and ran a race with them only to be told that the wobble was back and I wasn’t nearly as fast again. My “secret sneakers” had some kind of an irregular toe design to them that caused my toes to become squished in an odd way . . . making me wobble when I tried to sprint. No wonder that salesman said the sneakers were still a “secret”. Previous PostRemoving The Biggest Obstacle That Is Stopping Your SuccessNext PostIn Business, What Is Your Greatest Fear? This is exactly what even some of the giants in the industry fail to understand! I do not believe in ‘comfort zones’ but once you change what made you great and try to be something else, that is the quickest path to failure. You are correct to emphasize remembering what you did to succeed. 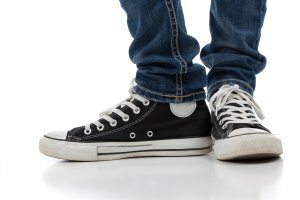 The story of the sneakers is a good analogy for business, I think that the lesson I gathered from “Decisions made in the dark look different in the light” was that you should practice something you are doing new before a big event or test. It situations like that, there are oftentimes much that can be taught and learned, if one simply pays attention.